Doors Open at Noon – Two Sessions – Akathist at 5 pm. Fr. Christophe, M.S., Pastoral Counseling, is the Executive Director of the nonprofit ministry “The Fellowship of the Inexhaustible Cup”. He is also, with the blessing of the First Hierarch of the Russian Orthodox Church Abroad, the Rector of the Orthodox Chapel of the Mother of God, the Inexhaustible Cup, located in Natural Bridge Station, Virginia. He is an Orthodox Priest, an Orthodox Psychotherapist and a Pastoral Counselor. He holds an M.S. in Pastoral Counseling from Iona College, New Rochelle, New York. He also has an undergraduate degree in Psychology with a specialty in Early Child Development, from Vassar College, Poughkeepsie, New York. He also conducted graduate work in Bioenergetics as part of his Master of Science Graduate Program. A founding member of the Greenwich Hotline for Crisis Intervention and the Vassar College Drop-In Center for on campus intervention. His tenure includes work with the Center for Christian Counseling and Healing in West Haven, CT; the Pastoral Theological Institute in Madison, CT; the Christian Institute for Psycho Therapeutic Studies in Hicksville, Long Island; supervision with the C.G. Jung Institute for Training and Therapy Center in Manhattan; and the Temenos Institute in Westport, CT. He is now working exclusively with the ministry he founded along with his wife, Matushka Cynthia. Based upon ancient Russian models, “The Fellowship of the Inexhaustible Cup” offers individual, marriage and family pastoral counseling. In 1997, he participated in a workshop led by Metropolitan Hierotheos Vlachos on Orthodox Psychotherapy which presented a turning point in his career. Since that time, he has integrated the Science of Orthodox Psychotherapy and the Science of Spiritual Medicine, as taught by the Holy Fathers of the Orthodox Church, in his marriage and counseling work. His commitment is not just a career, but a cause, which happens to be his career. He has developed the fullness of a ministry to the addicted and the effects upon adult children and to suffering people who are in families where addictions and their destructive effects have been present. 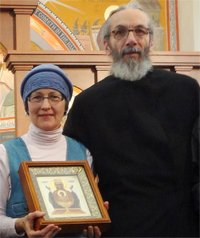 Father Christophe and Matushka Cynthia are extremely indebted for the holy spiritual care which they have received from their spiritual father, the Archpriest Gordon Walker of Blessed Memory (St. Ignatius Antiochian Orthodox Church, Franklin, TN) for the past twenty-three years. This podcast series is an attempt to present a holistic and comprehensive perspective on the treatment of addictions combining the value of both traditional 12 step recovery fellowship participation and the pure methods of treatment within the Holy Orthodox Church as taught by the Fathers and Mothers. It will include three major discussions on treating alcohol and drug addiction, the sexual addiction and the relationship illness known as co-dependency. After this general over view, he will also include teachings on Holy Matrimony (the therapeutic relationship), the Holy Mystery of Confession/Communion, the proper use of the Jesus Prayer (the Hesychast Tradition) and will offer some teachings on the very important Five Stages of Forgiveness. Fr. Christophe invites all listeners and inquirers to participate in a question and answer period after each podcast. He also invites all to consider membership in “The Fellowship of the Inexhaustible Cup”. This ministry of intercession recognizes that shared prayer under the Omophor of the Mother of God is the source and dispenser of the action of the Holy Spirit in the treatment of all manner of addictions. More information about The Fellowship of the Inexhaustible Cup. Check out Fr. Christophe’s latest podcast on Ancient Faith Radio. All services are in English, and all are welcome! See our church schedule for all other services and activities.